I absolutely love it when I read stories about these kind of moving out of London adventures. I'm booking my trip to visit! On 10th August 2016 I handed in my Liberty and Virgin Media security pass and walked off to Kensington Olympia station to travel down to Beer. I didn’t look back but as I walked away I checked myself on how I felt. The answer was free! I was free to become the full time Chief Holiday maker and Owner of The Folletts at Beer. I was born in St. Thomas’s hospital opposite Big Ben. I went to Uni in London and worked in London all my corporate life until what I call my ‘wake-up’ moment. In February 2013 my darling Dad went to A&E with chest pains. What we thought was a heart attack turned out to be cancer of the Oesophagus, which was a really late diagnosis and there was nothing the doctors could do other than palliative care to prolong life, not save life. My family went into complete shock and meltdown. How could this wonderful man with a big personality who everyone loved be going to die? Then in April 2013 on her 40th birthday, my very close friend found a lump in her breast. By December of the same year she lost her fight and left her son and my god daughter Kimberley. After my father died, six weeks later Barry’s father died and then his mother. This was our wake up call. We decided life was too short to spend it working for someone else. One of the last things my Dad said to me was ‘You work too hard, please slow down sweetheart’ so this is what I’ve done. Barry and I went on a research trip in March 2015 and looked at 5 properties in Dorset and Devon. It was purely a research trip. We fell in love with Garlands as soon as we walked through the door and saw the view. On the Sunday evening we had a serious chat about whether we were really going to leave our jobs and use our property as an income. On the Monday morning we put in a silly offer and by the evening it was ours. That evening we had a serious chat and did the financials. We realised that we couldn’t afford to buy Garlands and still keep our house in Woking, so on the Tuesday morning we put Little Heath on the market. By the Wednesday evening it had sold for the full asking price to a cash buyer! Fate intervened but we couldn’t move to Devon until Barry could retire at 55. Fate intervened again and two weeks before the Woking house completion a house two doors down came up for rent. So in June 2015 we moved half our belongings to Devon and half two doors down. 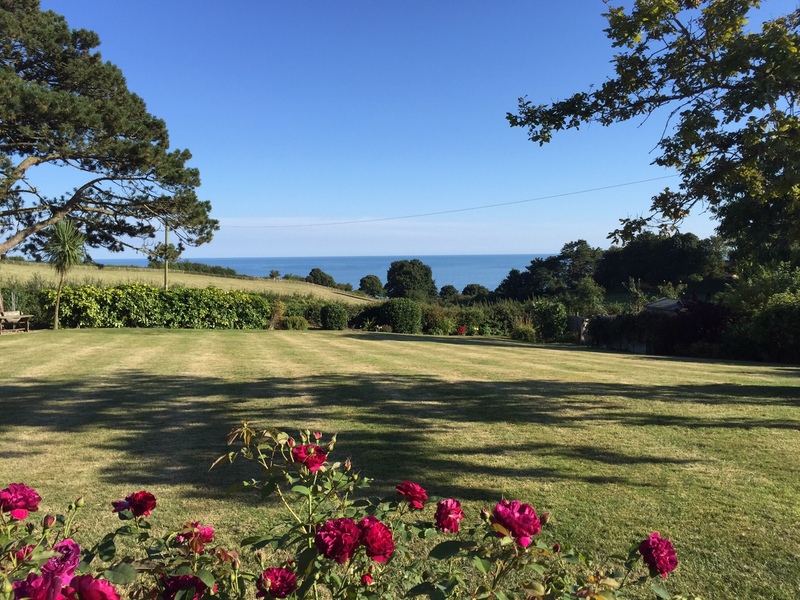 In June 2016 on the day Josh’s A’levels finished, we moved permanently to Devon. Barry retired and became our full time Head Gardener – a bit of a stretch assignment from Treasury Manager, and in August I became the Chief Holiday maker. So that’s the story. We now work one day a week, on changeover day, which is a Saturday. The rest of the time we choose what we do. I still have my list of things to do because at the end of the day I’m still running a business but the difference is that if it’s a good day my list will wait and we go out for a walk, coffee and cake. It’s a far cry from my London life and I love it. I know that Beer is where I’m meant to be at this stage in my life. Ironically as a family years ago we walked the South West Coast path from Seaton to Beer. I know that my Dad would have paused and looked over to Garlands and thought that’s a beautiful house, I wonder who lives there….. So if you’re thinking about making the move and want to talk to someone who’s done it in Devon get in touch, I’m happy to help. We arrived in Axminster July 2016 after 8 years in France. Believe it or not, it is so much busier than where we were before and I love seeing people walk past our house and chatting to passers by.